Handmade in Honduras, the Romeo Reserve combines Romeo y Julieta's legendary smoothness with the rich, hearty flavor of only the most choice Nicaraguan & Honduran long filler tobaccos. 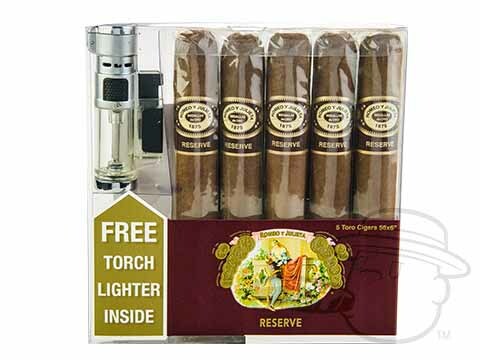 Seamlessly rolled in dark and oily Nicaraguan wrapper leaves, the Romeo y Julieta Reserve is a marvelously robust cigar brimming with earthy-spicy flavors and an inviting aroma, and this convenient gift sampler brings you 5 of them in the popular 6x56 Gran Toro size along with a free Torch Lighter to toast them up with. An awesome gift selection at an easy price. I really enjoy these cigars, and what a deal with the lighter! Great cigar, smooth finish. Double bonus, free lighter!! Great price on five very nice (~90) cigars and a workhorse lighter. Romeo Y Julieta Reserve Lighter Gift Set is rated 4.9 out of 5 based on 5 customer ratings.